Native American leaders and organizations point out that there is high demand for educators at Tribal Colleges and Universities (TCUs) as the institutions seek to prepare their students to become nationbuilders and sustain the history and vibrancy of Native cultures and languages. E­fforts to increase the number of Native educators over the last few years have largely been in place at TCUs, many of which recruit from within their tribal nation or tap into a population of educators who are passionate about upholding the cultural mission of TCUs, says Dr. Cheryl Crazy Bull, president and chief executive officer of the American Indian College Fund. The College Fund was founded in 1989 and serves as an advocacy and charity organization for the nation’s nearly three dozen tribal colleges and their students. The organization also supports Native students and educators at predominantly White institutions. 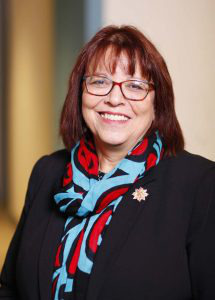 While Crazy Bull – who is a former president of Northwest Indian College in Bellingham, Washington – is an advocate of all Native educators working at TCUs, she acknowledges that that is not always the case. Some of the challenges that TCUs face in recruiting faculty include attracting potential candidates to their remote locations as well as competition for Native faculty among larger Research 1 institutions. “It’s very much an environment that’s very rewarding and very demanding,” she adds. An added challenge to sustaining teacher education programs for Native faculty is financial funding, says Dr. Jeremy Garcia, an assistant professor of teaching, learning and sociocultural studies and professor of American Indian Studies at the University of Arizona. Despite the challenges, research studies show that 85 to 90 percent of individuals who teach at TCUs end up staying because of faculty’s engagement and investment into their students, Native leaders say. Nearly 45 percent of tribal college faculty are Native Americans, Crazy Bull says. At Diné College, the nation’s first tribal college, faculty who planned to retire now say they want to stay to teach courses for the new Diné Studies bachelor’s degree, says Dr. Charles ‘Monty’ Roessel, president of Diné. One such individual is a faculty member who has served at the college since its opening 50 years ago. The Higher Learning Commission-approved Diné Studies degree will have an emphasis in Navajo language and Navajo Studies. Roessel notes that older faculty’s commitment to stay at the college is reflective of the value of storytelling in the Native community. Still, recruiting new faculty and grooming Navajo students to become the next generation of academics is a goal. As part of the college’s 50th anniversary celebration, Diné College hosted a fundraising gala to help students graduate debt-free, and the college had a monthly lecture series featuring college founders who talked about the institution in its early days. Officials also hoped to “entice” future young Navajo academics to return to teach at the college by highlighting former Diné students who have gone on to be successful, Roessel says. Currently, there are plans to relaunch Diné Press, the college’s academic press, and an interdisciplinary journal of the Navajo, which will give faculty an opportunity to showcase their scholarship and research. This summer, Diné leaders introduced a faculty ranking system that is based on traditional knowledge, the first of its kind at a tribal college. The faculty ranking system – designed to be similar to assistant and associate professorships – takes into account the cultural knowledge the faculty member has, knowledge and performance of tribal ceremonies and mentoring and apprenticeship experiences, among other cultural factors. “You start small,” Roessel says of faculty recruitment efforts. He adds that the college is working to be more strategic about identifying Native students who are in the process of earning their doctorate or who have aspirations to serve at tribal colleges. “That’s one of the big goals that we have right now,” he says. In an effort to increase the number of Native educators, the College Fund has a program for individuals who work at TCUs to finish their master’s or doctoral degrees, says Dina Horwedel, director of public education and communications for the organization. Through the program, tribal college faculty have the opportunity to participate in fellowships, attend an Intensive Writing Retreat, secure a professional development grant, share research during an annual TCU Faculty Research Convening and contribute to the Tribal College and University Research Journal (TCURJ). The value of having homegrown faculty members or faculty who can instill in younger generations of students the significance of Indigenous cultures and languages is critical, leaders in Native higher education say. At this year’s National Indian Education Association Conference in October, the Native Professional Educators Network (NPEN) hosted four sessions that focused on how Native communities can shape the education of their children and encourage ongoing dialogue about culturally-based teacher education programs. The sessions included Native community vibrancy through education; Indigenous knowledge, pedagogy and praxis; and Native teacher education programs. For the teacher programs specifically, presenters addressed preservice, induction, community-based practices and accreditation, says Garcia, a presenter during the session. “It’s multifaceted,” he adds, noting that NPEN is primarily about preparing Native teachers to become nationbuilders. Garcia says that the demand for educators depends on the tribal college, as some have a “steady flow” of Native faculty to recruit. However, he says it is important to prepare teachers who may also be navigating their own identities in the process of becoming a teacher. “Why don’t I speak the language?” is an “emotional question that hits people,” he says. Earlier this year, Diné College created its Navajo Language Immersion Institute, and the college used a grant from the Bureau of Indian Education to help K-12 schools improve their Diné language courses in order to help students reconnect and engage their language and culture earlier. Now, NPEN will continue to bring individuals together to share best practices and build momentum around the conversations about how Native educators shape the lens of their curriculum, pedagogy, student interaction and their sense of self as nationbuilders. Tiffany Pennamon can be reached at tiffanypennamon@diverseeducation.com. You can follow her on Twitter @tiffanypennamon.